James Irvine- My concern is disinterestedly academic, and was sparked merely by the discussion of their possible succession from Scotland contained in the academic paper Mary linked to. FWIW I’m neutral on the subject of Scottish independence per se- and if the break-up of the UK kills the great power posturing of our political elite stone dead, then that for me is a positive outcome. Where I seem to have antagonised Caledonian sensibilities is by challenging the (mistaken) assumption that Scots independence necessarily means Scottish ownership & control of all North Sea hydocarbons due north of a line across the sea parallel with Berwick on Tweed. And also, FWIW, my suspicion that the Northern Isles have been ‘British’ for longer than they were ‘Scottish’ also seems correct. Scottish sovereignty over the Isles was secured only in 1470, so they were indisputably ‘Scottish’ for only 237 years. This nonsense about Blair has really taken hold, hasn’t it? He was born in Edinburgh, true, but left as an infant. His father was partly raised in Glasgow, true, but was originally from Yorkshire. That is the sum total of Blair’s connection with Scotland. The pdf is a good find and shows a distinct blob of oilfeilds switching sides with new labour’s border shift. Jinglyjangly’s link (click crab) is intresting background. 3,500 jobs are going at RBS (just announced) yet the ex-ABN Amro executive John Hourican who is now head of investment banking at RBS is set to get a £4.3m bonus. It was the acquisition of ABN Amro that broke the back of RBS under Goodwin and Matthewson. @ Mary, I think Mathewson had left well before the troubles started. I’m trying to think of th chairmans name at the time. what a great link to Cherie’s ups and downs, I never understood what attarcted her to such a wet rag as Tony. Agree with Crab, this opportunity is too good to let pass, Independence must mean revolution, lets get rid of centralised politicas that is easy to knobble by foreing interests. By that reasoning, any other part of Scotland ceased being Scottish in 1707. Thanks for correcting me Rob. I knew I had got the wrong name but should have checked. Fred the Shred took over as CEO from Matthewson. The chairman at the time of collapse was Sir Tom McKillop who should have stuck at AstraZeneca. This is the current list of gangsters-in-charge as I call these boards of directors. They are all interchangeable and always have connections to other companies. A magic roundabout. For pure comedy value, here’s the Torygraph’s argument as to why Scotland should not become independent: because the Scottish taxpayers couldn’t afford to bail out RBS by themselves. Only if ‘Scottish’ & ‘British’ are mutually exclusive categories. I used inverted commas since both terms carry ideological baggage, especially north of the border- and even more so across the water. Clearly the Northern Isles have been both ‘Scottish’ & ‘British’ since 1707, but may revert to being exclusively ‘Scottish’ if Salmond wins his referendum. Except for the fact that he went to achool at Fettes, read for the Bar in Derry Irvine’s chambers, shared a flat at that time with Charlie Falconer, & had a bagpipe playing Anglo-Scot as his chief PR man ! Rather a lot of Scotch connections there, I think. Hi Sam, I hold a fairly considerable number of shares in RBS, so I have poured a lot of hard earned money down the pan already. No one has ever sent me a report that points to where all the so called debt is or what they are doing to collect it or write it off. You would think that in the age of computers it would be easy to send an explanation, maybe a pdf. document. It makes me wonder if the fiqures they bandy about are indeed true. There is a court case in the offing about Rights Issue shares that were sold to us fraudulently. If the shareholders win, wouldn’t you expect some highly paid financial fraudsters to be arrested? I’m not holding my breath, either way. The concept of independence is illusory. All nations are under threat from World Government. Agenda 21 of the UN specifies the end of all nation states. Scotland and ROUK would be more easily overwhelmed by globalists once broken down into smaller more consumable units. The only political units able to resist global power are national political entities, which is why the globalist agenda includes the dismemberment of nations. Cameron is a complete backer of the global elite power agenda. An ‘independent’ highly indebted Scotland is very much an objective for the banking elites. A reduced Great Britain would find the Falklands Islands resources removed from her ownership, and placed into the hands of corrupt biddable South American regimes as the next step, once Scotland is split away. we all lose, once the globalists have got us separated. Not sure about that. But a referendum on an English Parliament would be nice! So what we have in reality is just a load of nationalistic flag waving and trying to whip up border disputes – a source of more wars in this world than I would like to mention. BTW I suspect that someone who was born in Norfolk and is half English probably should throw the traitor lable around too easily. Gordon Dewar was an honourable man who campaigned for and delivered devoltion for Scotland just as he promised. Re the stealing of our territorial waters …i remember when this crime took place , of course there was virtually no reports on it in the Scottish Media ! . Are such issues not decided by the Mercador Principle ? . If so we should be able to challenge it in the appropriate International Court?. On the Banking myth….ie Scotland would have had to bail out the Banks resulting in our complete downfall… go away and look up Prof Andrew Hallet’s judgement on this one DEMOLISHES the contrived lies in an instant!. Alba gu bragh! I don’t know what the Scots can do about the media, it is all English or English-centric. They don’t even have a tv station. Very difficult for people to get pro-Scottish information or even unbiased. Very few countries have as many different maritime boundaries as the UK, which has boundaries with Ireland, France, Belgium, Netherlands, Denmark, Norway, Iceland and Denmark Faeroes then Ireland again. Not to mention France/Channel Islands, and then the waters of the dependent territories. So I repeat, very very few people in the world have as much experience of maritime boundary negotiation as me. I did not use the word expert, incidentally, you did. Sorry for arriving a bit late. As far as I know, the legal jurisdiction over the oil & gas fields is still as defined by the Continental Shelf (Jurisdiction) Order 1968. The 1999 boundary being discussed pertains to fishing rights and I find it a bit odd that the two maps I have seen published on government websites ( the one cited in an earlier comment and the one at http://og.decc.gov.uk/assets/og/data-maps/maps/infrast-off.pdf ) show borders which do not pertain to the oil & gas industry. The map cited earlier in these comments shows this 1999 border, and the map I have just cited shows a border which is clearly labelled as the RENEWABLES energy boundary. Why should official maps of the oil and gas fields show boundaries which are not applicable to the oil and gas fields? Could it be a deliberate misrepresentation? BTW, the Continental Shelf (Jurisdiction) Order 1968 sets the boundary as the line of latitude at 55° 50′ North, i.e. an east-west line slightly north of the eastern end of the land border. You only have to step back to see how almost “Nazi” like the SNP have been in whipping up anti-English hysteria across Scotland. Being English and having been working there for 2 years, I can confirm it’s well and truly alive despite the general “line” that it doesn’t exist. There is so much unfounded racism and hostility towards English, it’s quite disgusting. Scotland has benefited hugely from being part of the Union for the past 300 years. And it’s rather distasteful that suddenely it doesn’t suit them because there is some oil and they think they have 100% rights to it, and the rest of the UK shouldn’t see a drop. Well what about the flow of prosperity that has gone the opposite way. Huge invertment has been pumped into Scottish industry by the UK government for a very long time indeed. And make no mistake, all this independence chatter is about nothing but money. The same blood lives north and south of the border, but with a different accent. Apart from the mentions already about the dubious claim of Scottishness to the northern islands, England can also lay claim large areas of the southern “Scottish” lands. Just take a look at some history and you’ll see why. Therefore there is no justification to choose the period just prior to the union as a baseline. Judging from their website, either they’re incompetent, they don’t care ‘cos they think no one ever looks at their info, or both. Please explain how one can be racist about people with “the same blood”. Because I know the law. I run a business and have to teach these issues to employees. Take a look and educate yourself. I also employ 3 scottish staff south of the border, and they don’t experience the same hostility. In fact one of them was quite astounded when he saw how I was treated (he was working with me), as he has been living in England for the past 10 years. Ricky, It’s generally believed that when we judge our neighbours we see a reflection of ourselves. Craig, thanks so much for this post. I have forwarded the link to those I know with a specific interest in the issue. You might be right in your conclusions, but if Scotland elects to become independent and an international arbitration on the maritime boundary were to follow, which seems quite possible, we will find out. However, this introductory part of your text shows that your article is far more a product of emotion than logical analysis. I therefore do not trust your judgement on this. There is then of course the separate issue of how maritime boundaries are to be translated into revenues with respect to fossil fuel extraction. Do you have any evidence that acceptance of the maritime boundary has been suggested as a precondition for an independence referendum? If not you are just setting up a straw man to knock him down. 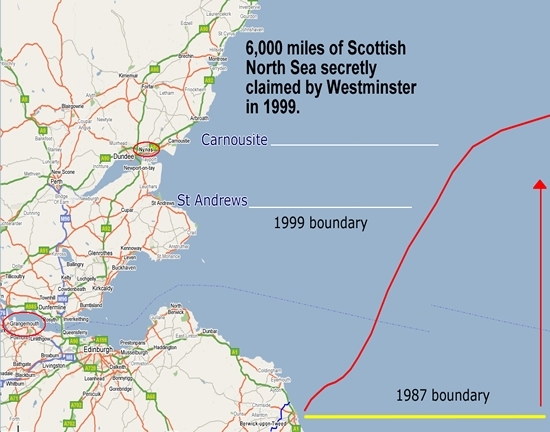 That said, your thesis as to where the boundary might be is exactly what might be expected of a Scottish separatist. Fair enough, but do you not live in England and did you not fight fight an English seat at the last general election? Another Scot, it seems, so loyal to his native land tht he will do anything for it except live there.